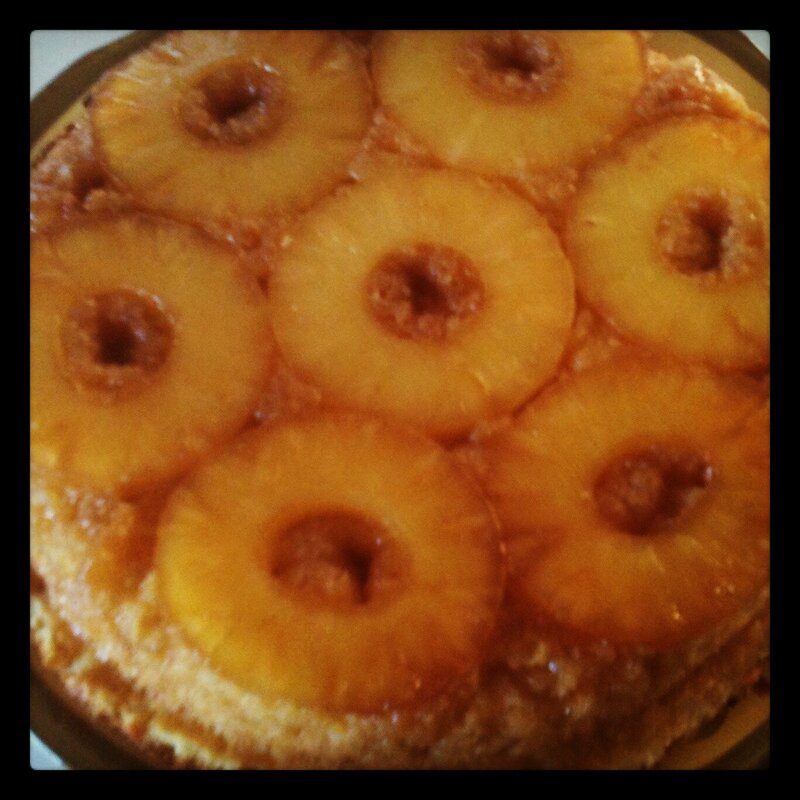 This sort of falls under the "semi-home made" category, but it was my first ever Pineapple Upside Down Cake and we all enjoyed it, so it's worth sharing. We had some family friends and my parents over for dinner. I've known Jack and Sylvia pretty much my whole life. They live out in western NC now, but occasionally come to the Outer Banks to visit. My dad tipped me off ahead of time to make this cake for them, and to be honest I was a little nervous. Last time I made an upside down cake it stuck to the pan and I had to patch it back together! I used a highly reviewed Dunkin Hines recipe, with a few alterations to cut back on fat, calories, and sugar. Preheat oven to 350°. Generously grease a 12" baking pan. Melt butter for the topping in a medium bowl in the microwave. Stir in the brown sugar until dissolved. Spread into the bottom of the baking pan and arrange the pineapple rings, cherries, and/or walnuts, if using. Bake for 1 hour, or until toothpick comes out clean. Let cool a few minutes, then invert onto serving plate while still warm. I was so excited it popped out of the pan cleanly! The cake itself was really moist and rich. I've heard people boasting about including instant pudding in cake mix before, but never tried it myself. And my will power is happy to report we sent the leftover half of the cake home with Jack and Sylvia! I've really been trying to behave myself the past few weeks since the wedding is next month. I bought my dress back in January, a few pounds lighter than what I am now. Of course, as soon as I put my mind to eating healthier, I instantly crave all things obnoxious. Soda, cheesy meals, things covered in gravy, and deep fried anything. So when I saw Ally post these Boneless Buffalo Wings I knew I hit the jackpot and bookmarked them right away! Baked chicken is on the healthy end of the spectrum, but boneless wings with the finger licking sauciness would seem like I was indulging in a sinful meal! I made a much larger quantity, and I had to change a few things due to what I had on hand. In a large bowl, beat the eggs and milk. In a second large bowl, stir together the flour, cheese, garlic powder, and paprika. Cut the chicken into little 1" chunks. Soak in the egg bowl, then move the pieces into the flour bowl and toss to coat. Spread out onto two greased baking pans and bake for 20 minutes, flipping half way through. Once cooked, put the hot chicken chunks into a large bowl. Pour the buffalo sauce over top. Fold with a large spoon to coat everything evenly. Plate with celery sticks and bleu cheese or ranch dressing. Serves 6. I didn't know it beforehand, but both Lyn (our company) and Johnny are not big fans of buffalo wings or bleu cheese. They both ate and ate and ate multiple servings of this, praising it highly. This recipe is definitely a keeper. Quick, easy, and painless. Plus a lot of veggie-munching goodness! This was inspired wholeheartedly by Laura's broccoli cheese quinoa, posted earlier this summer. I bookmarked it until I had the time and kitchen to make it myself. I kept mine really simple and strictly broccoli and cheese. Hers is a lot more inspired. This is one of those dishes you can add to based on your personal preferences. Two of my favorite little girls, my God daughter and her sister are visiting. I gave them a vote of taco night or broccoli and cheese with a special new food said KEEN-WAH! Surprisingly, it was a unanimous vote against taco night! I didn't mind, though because I really wanted to try this! In a large pot I cooked the quinoa and vegetable broth. Alongside, in a separate pot I steamed the broccoli. When the quinoa had just a minute or two left, I stirred in 1 cup of the cheese, until fully melted and replaced the lid. Drain the broccoli of any residual moisture from steaming and dump in the big pot. Fold everything together until incorporated. Serve sprinkled with the additional cheese. Serves ~6 adults a dinner sized portion. Yum, this was so good. All of us "big people" had two servings. I also served roasted buttercup squash alongside for more bulk to the meal. Thankfully there's lots of leftovers for lunch today! I can't wait to dig into them!